This Oil Fill relocation kit was originally designed for our Individual Throttle Body Intake Manifold. Because of the larger plenum on this intake, we needed to do away with the standard yellow oil fill cap and it's location. 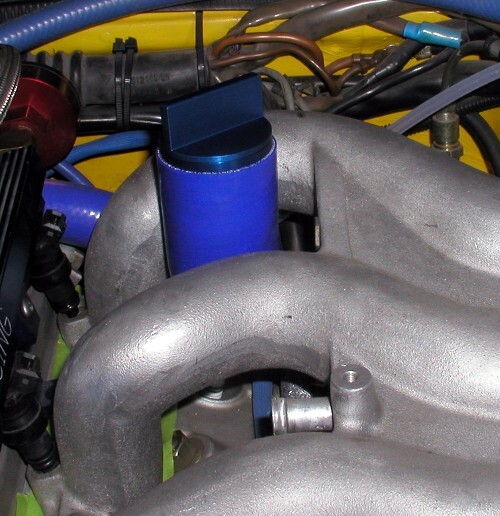 This kit moves the oil fill cap to either between the runners, or behind the plenum, depending on what you're doing and what parts you want to fit it with. In the case of our ITB intake, between the runners. We decided that we would offer this kit separately for those looking to do some intake work and need the room like we did, or just someone wanting something different then the stock oil fill cap and it's look. Something a little more stylish perhaps. You will be required to cut off a portion of the AOS (Air Oil Separator) tank in order the install this kit. In order to do that, the AOS will need to be removed from the car. Unless maybe you're using a hot knife or something that would allow you to keep the debris out of the tank. Refer to our Tech Garage for more details on that. Above you see the kit (less the hose clamps) from the AOS tank. Above you see the filler cap location between the runners on a stock intake. Our 4 port intake vacuum fitting banjo bolt will not work with this location. 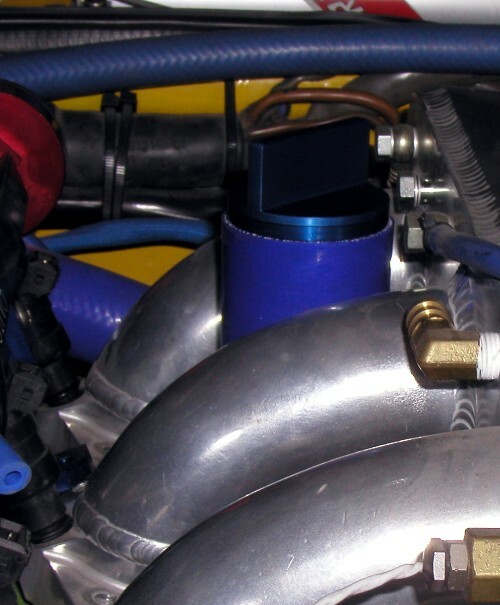 Here you see the fill cap behind the intake manifold plenum. 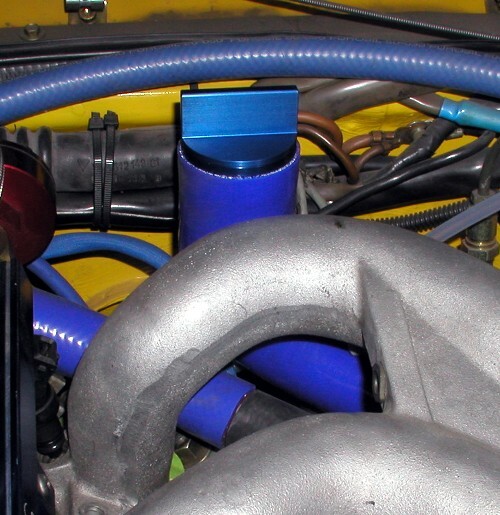 Here you see the fill cap between the runners on the Lindsey Racing Intake Manifold. 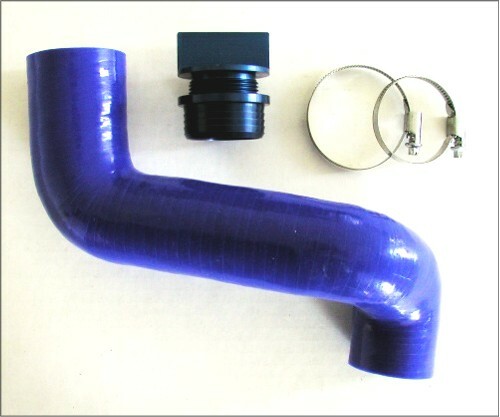 our custom made silicone hose and is secured with the supplied hose clamps. Oil Cap & Neck in Red or Blue anodized. 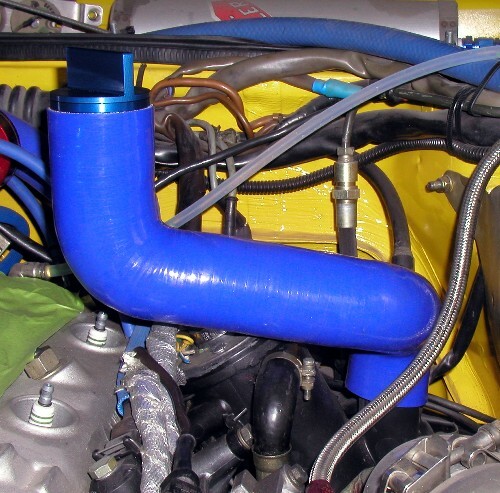 Silicone Relocation Hose in Red, Blue or Black.